Let's face it. Create anything having to do with Star Wars and you have an instant audience. It is an iconic franchise spanning generations. Disney XD and Lucas Films LTD obviously know this and are taking full advantage by creating an animated, children's show. New to television this Fall, it's call Star Wars Rebels. Set between the events of the Episodes III and IV movies, Rebels tells the story of Ezra Bridger (Taylor Gray; Thunderstruck) a streetwise orphan stealing what he can to survive. When he stumbles upon a robbery in progress he decides to get in on the action and finds himself aboard a ship with a group of Rebels fighting the Empire. 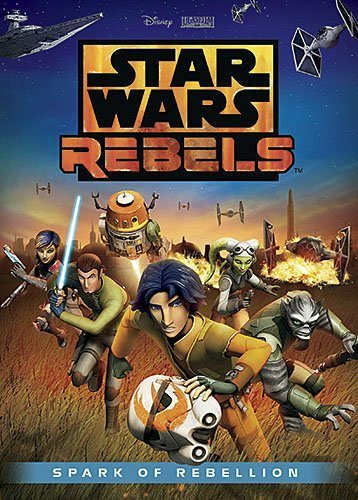 These Rebels include an alien ace pilot, Hera, voiced by Vanessa Marshall (Young Justice), Zeb, the "muscle" of the group, voiced by Steve Blum (The Boxtrolls), Sabine, the strong female fighter, voiced by Tiya Sircar (The Crazy Ones) and Kanan, the leader hiding a secret, voiced by Freddy Prinze, Jr. ( 24, Scooby-Doo). The first DVD is a 43 minute movie that sets up the whole premise of the show airing on Disney XD. When Ezra helps the rebels fight the Empire he suddenly finds himself as the newest member of the "team". Along the way Kanan "mentors" Ezra in the way of the Jedi Knights of days past. Through Kana's teachings, Ezra learns about the force and how strong his connection is to it. The DVD includes a 3-D model that children can put together and some extras which are really pieces of other scenes from episodes yet to come. There is one segment where the creators discuss the idea behind the show but otherwise nothing especially interesting. The Animations is top rate but one would expect no less from Disney. The picture quality is sharp and the colors are bold and vibrant. The visual has a little bit of an "anime" feel to it but it doesn't distract the viewer. The sound is terrific and, of course, enhances the thrill when we see and hear the light saber wielded by both Ezra and Kanan. The actors give solid performances with the exception of Taylor Gray as Ezra. I found his acting to be flat and boring and I'm surprised he was chosen to star in this show. Freddy Prinze Jr. is good as the calm, collected, yet still feeling leader of this group of thieves. I also enjoyed Marshall, Blum and Sircar and liked the way they added to the overall feel of the cartoon. Ultimately, I felt I was watching snippets of other shows all mixed together into a children's cartoon. When we meet Ezra, he is tricking the authorities in order to help an old man who is about to be arrested and I had flashbacks to Aladdin. The crew of rebels pulling off the heist from the empire reminded me of both Firefly and Guardians of the Galaxy. Download Star Wars Rebels: Spark of Rebellion from the iTunes Store in Digial HD. For more information about Star Wars: Rebels visit the FlickDirect Movie Database.